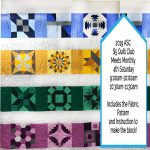 In this 3 part series, we will build on our previous learned skills to be an even more confident quilter. Must have taken beginner Quilting 101 or have gotten prior approval from the instructor. This round of Block Swap features fabric from the Cotton + Steel ladies! Participants will piece nine 12.5" blocks in a design of their choice. Keep one and bring the rest to the swap! We have chosen a selection from Black and White! Stop by the store and pick up a kit; we cannot wait to see what you create!